A detailed account of the transition from a sparse and chemical dependent landscape to an ecologically diverse and resource efficient garden. Our rural 1/3 acre of land in Northern California has been our home and office as well as a continual experiment in ecological land care and permaculture for over 6 years. Our decision to relocate to the ‘city’ this month has us pondering just how much we’ve improved this particular piece of land in the short amount of time we’ve been here… so I decided to take a journey back in time. Unbeknown to us in 2005, we moved into a chemical dependent neighborhood; neighbors who rely on pest control companies, Round Up and weed/feed for regular property maintenance. Within our own property we found enamel paint had been washed out on the back lawn and evidence of recent herbicide and pesticide spraying around our new house (pest company sticker in the garage with the date of application). 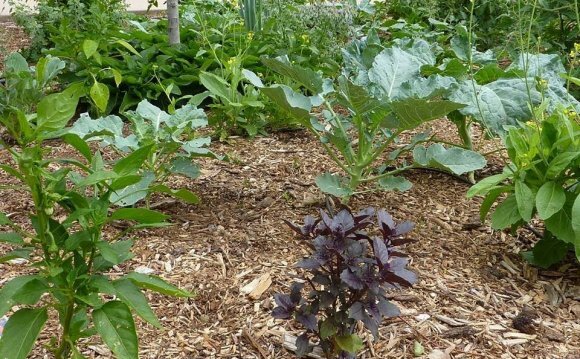 Having gardened ecologically for a long time, we have learned a lot about how to make the transition from a chemical dependent landscape to an organic and biologically based one, and how to do it with little time and effort. On a typical residential site this ‘transition period’, from chemical to biologic/organic, can take anywhere from 3 to 6 years. It really depends on the degree of degradation to be able to determine the amount of regeneration needed. In our case the land simply needed to be ‘cleansed’ and given new life. Time has been the number one factor in the regeneration of this property more than anything else. Build healthy soil and increase diversity and Mother Nature will heal herself. The front yard almost became what we set out for; a drought tolerant, low maintenance wildlife garden with a cottage look and feel. Despite the front garden’s proximity to the front door and kitchen we chose to put our food bearing plants in the backyard as the front yard’s distance to the road and neighboring pesticide use made me shy away from growing food there. The image in the photo looks like a typical suburban landscape (we’re 20 minutes from a major city). Three large trees: 1 Raywood Ash in the center with 2 ornamental Mulberry trees – one at each end of the yard. The trees have been wonderful, providing deep shade part of the day for this western facing front yard, lots of leaf mulch every year and structures for our boys to climb and swing from. The lawn was mostly wide leaf St. Augustine grass which may be the best turf for this region as its very drought tolerant. There were also a few miniature Agapanthus, a couple of roses growing from root stock, a few Nandina and Boxwood and lots of Photinia (a short hedge of it behind me in the photo). There was only 8 different kinds of plants. Talk about a lack of diversity. There were virtually no beneficial insects at all and certainly nothing inviting them to stay. It’s difficult to tell in the photo above but the slope down from the house to the street is fairly gradual with a few areas of steep downward angles next to the fence and adjacent road. Now note the lack of gutters on the porch and main roof; when it rained water would pour off the roof hitting the compacted ground below. This water never really infiltrated. It just ran onto the compacted turf and continued to flow downhill — eroding away much of the topsoil along with it. We noticed right away our rooftop rainwater just accumulated in the street below along with valuable topsoil; totally unused by the land above. The lawn went first in spite of its drought tolerance. Turf grass is a monoculture crop and just tiresome when not used for soccer or grazing sheep, so we killed it by simply ignoring it. We didn’t sheet mulch any of it, we just didn’t irrigate for a long, long time. We did lay out arbor chips over the dying grass, shredded from pruned trees on site, to help protect the soil and every so often we pulled a few weeds — noxious weeds like bermuda and foxtail-type grasses. We left dynamic accumulator ‘weeds’ like dandelion to help build soil fertility. When we were able to take the time to play in the front yard we started by laying the foundation. Remember how I said the porch and house didn’t have gutters? Well it still doesn’t. In 2006 we chose to dig an infiltration trench, much like a French drain but mulched instead of cobbled, directly under the eave line off the roof. This catches the main wall of rainwater falling off the roof and stores it before infiltration. We’ve found the soil here drains very quickly when not heavily compacted by 30 years of falling water slamming into it so we felt this method would be adequate and require less resources than buying and installing gutters. We did plan for overflow of the trench which would drain into an area near to the Raywood Ash we hoped would become a meadow like feature. To date the trench has never overfilled. In 2008 we dug about 15-20 small mulch basins up-slope and parallel to the railroad ties. Rather than dig a whole swale on contour in this small space we chose to dig a bunch of mini mulch basins. These consisted of small ditches about 1 cubic foot down with a lip (meaning we placed soil from the basin down slope so if the basins overfill the water won’t erode downhill) and we filled them all with arbor mulch.